This is the third article of the iOS Programming 101 series. 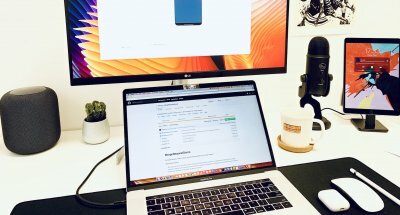 In the previous two articles, we showed you how to hide the tab bar and implement email feature in your app. In this article, we’ll show you how to add GPS capability in your iPhone app and retrieve the user’s current location. We’ll even cover tip to translate the GPS coordinate into street address. It’s gonna to be fun and pretty easy to implement. Location services provide a way to improve your app by enhancing the user experience. If you’re developing a travel app, you can base on the users’ current location to search for nearby restaurants or hotels. You can also find the location feature in most of the Photo apps that saves where the pictures are taken. 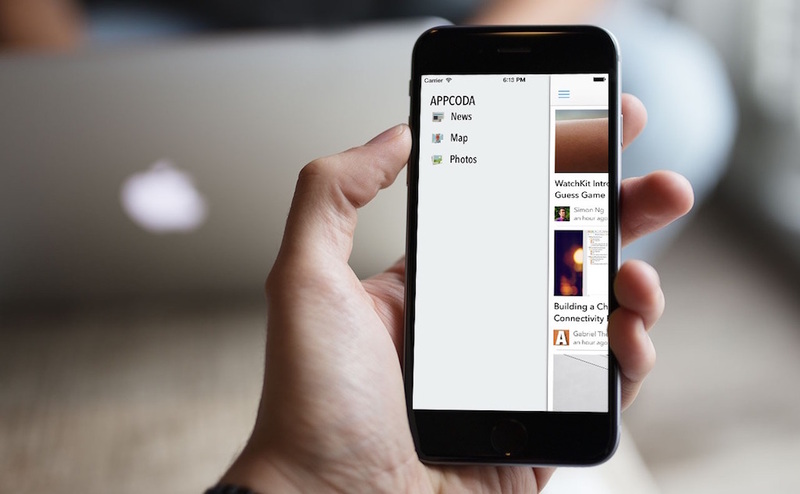 The Core Location framework provides the necessary Objective-C interfaces for obtaining information about the user’s location. With the GPS coordinate obtained, you can make use of the API to decode the actual street or utilize the Map framework to further display the location on Map. Once you’ve successfully created your project, go to the Storyboard and design the user interface. In the View, add three labels for latitude, longitude and address. For each label, place another label next to it. Later we’ll use these labels to display the GPS coordinates and address. Finally, insert a button and name it as “Get My Location”. Your user interface should be similar to the one shown below. For the “For Address” label, change the “lines” option from 1 to 4, as we’ll display address in multi-lines. You may also decrease the font size to 14 points in the Attribute Inspector. Next, we’ll connect the UI elements with our code. In the Storyboard, select the view controller and switch to the Assistant Editor. 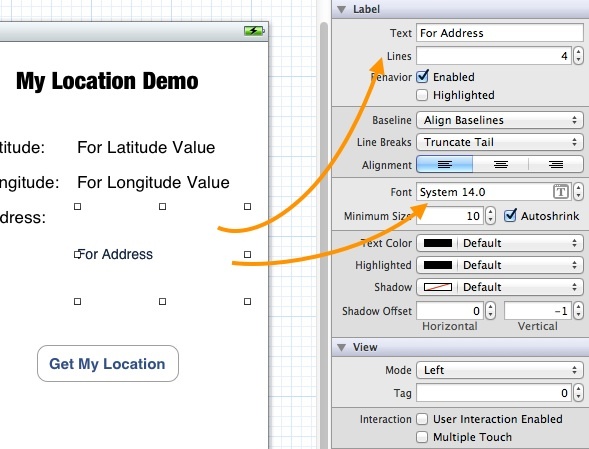 Press and hold the control key, click the “For Latitude Value” label and drag it towards the “MyLocationViewController.h”. Place the cursor between the @interface and @end keywords, you should see a prompt that allows you to insert an outlet. Name the outlet as “latitudeLabel”. Repeat the same procedures and create the outlet for the “For Longitude Value” label and “For Address” label. Finally, create an action method for the “Get My Location” button and name it as “getCurrentLocation”. This method will be invoked when it detects a Touch Up Inside event. To retrieve the current user location, as mentioned earlier, we’ll make use of the CoreLocation framework provided by the iOS SDK. By default, however, the Core Location Framework is not bundled in any Xcode project. We have to add it manually. 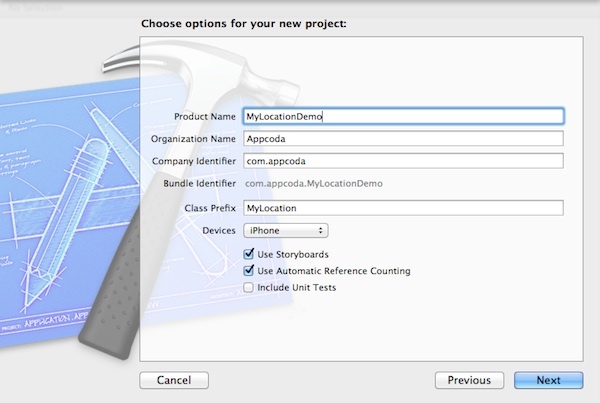 In the Project Navigator, select the “MyLocationDemo” project. In the Content Area, select “MyLocationDemo” under Targets and click “Build Phases”. Expand “Link Binary with Libraries” and click the “+” button to add the CoreLocation framework. Let’s move onto the core part of this tutorial. Core Location framework, that you’ve just added, allows you to retrieve the user’s current location in the form of latitude and longitude. It can even give you continuous location update if the user is on the move. 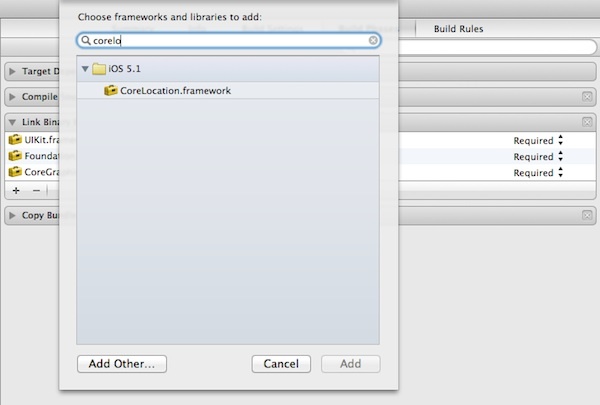 Like other libraries in the iOS SDK, Core Location makes use of the delegate pattern. To work with the Core Location framework, our view controller should conform to the CLLocationManagerDelegate protocol. This protocol defines methods used to receive location and heading updates from a CLLocationManager object. To let the view controller know about the CLLocationManagerDelegate, you first import the corresponding header file. In the “MyLocationViewController.h”, add the #import statement and implement the “CLLocationManagerDelegate”. Now go to the “MyLocationViewController.m”. Declare an instance variable and name it as locationManager. 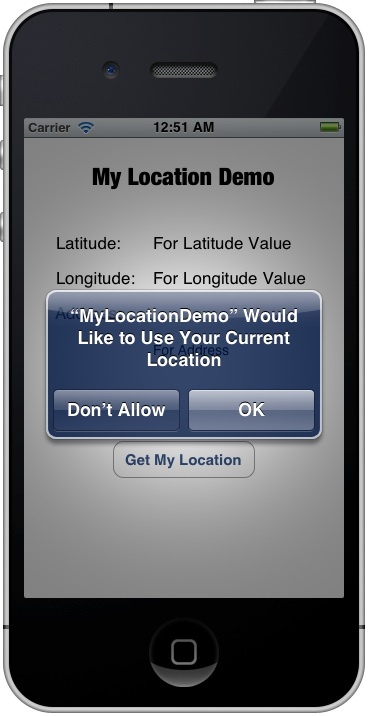 The CLLocationManager is the object that provides you the location data. Once you initialize a CLLocationManager object, you can simply call the startUpdatingLocation method to the location service. The service will then continuously send your application a stream of location data. As discussed earlier, the location data is reported to your app via the location manager’s associated delegate object. Here, we assign MyLocationViewController as the delegate object. All the location updates will send to the delegate. To capture the location event, we have to implement the delegate methods as defined in the protocol. Now you can compile the app and test it by using the Simulator. 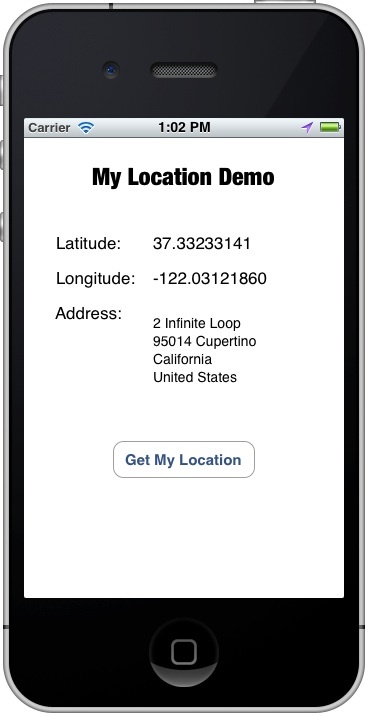 You may wonder how you can use the iPhone Simulator to test location-aware application. How can the Simulator retrieve the current location? There is no way for the Simulator to get the current location as your computer doesn’t have GPS built-in (even you have, Xcode won’t use it). However, the Simulator allows you to fake it. Remember to accept it, otherwise, the app will not be able to access the location service. Oops! The app displays an error even you tap the OK button. Why? By default, the Simulator doesn’t know its own location. In the menu bar, select “Debug” -> “Location”. The default location is set to “None”. That’s the reason why you get the “Fail to Get Your Location” error. Now change the location setting to “Apple” (or “Apple Stores”). Your app should now show you the latitude and longitude values. Xcode offers another way to simulate location. While running the app, you can change to other locations by using the arrow button in the top bar of the debug area. The CLGeocoder class provides services for converting between a GPS coordinate and the user-readable address of that coordinate. By specify the latitude and longitude of a given location, you can use CLGeocoder to find a user-readable address. The result (i.e. the address) returned by CLGeocoder is saved in a CLPlacemark object. Back to your Xcode project. Add two instance variables: geocoder and placemark. We use the “reverseGeocodeLocation” method to translate the locate data into a human-readable address. The geocoding operations doesn’t happen on the device. The method instead submits the given data to the geocoding server in the cloud in order to resolve the address. Other than the location data, you have to provide the handler that contains code to execute after the address is resolved. In this case, we’ll update the address label to display the address on screen. The syntax of the completionHandler may be new to you. Instead of using delegate to provide feedback, the CLGeocoder uses “block” to deal with the response. By using block, you do not need to write a separate method. Just provide the code inline to execute after the geocoding call completes. Upon completion of a geocoding request, the completionHandler will be invoked automatically. The resolved address is saved in CLPlacemark array. Placemark data includes information such as the country, state, city, and street address. So we simply pick the CLPlacemark object from the array and show the address in the address label. The app works but it consumes a lot of power. Why? What the app does is to retrieve the current user’s location. It shouldn’t consume much power, right? Let’s revisit our code again. Once the user taps the “Get My Location” button, we’ll call up the “startUpdatingLocation” method to retrieve the user’s location. "Apple Inc., Apple Inc., 2 Infinite Loop, Cupertino, CA 95014-2083, United States @ <+37.33270820,-122.03033640> +/- 100.00m, region (identifier <+37.33270823,-122.03021599> radius 58.34) <+37.33270823,-122.03021599> radius 58.34m"
As you can see, the “didUpdateToLocation” is invoked multiple times and it just keeps going on and on. So how can you tell the location manager to stop from updating the location? You can use the “stopUpdatingLocation” method to disable the location update. For our app, we can stop the location update once we retrieve the current location. Try to run the app again and check out the output message in the output area. You should notice that the “didUpdateToLocation” is called once and stopped. 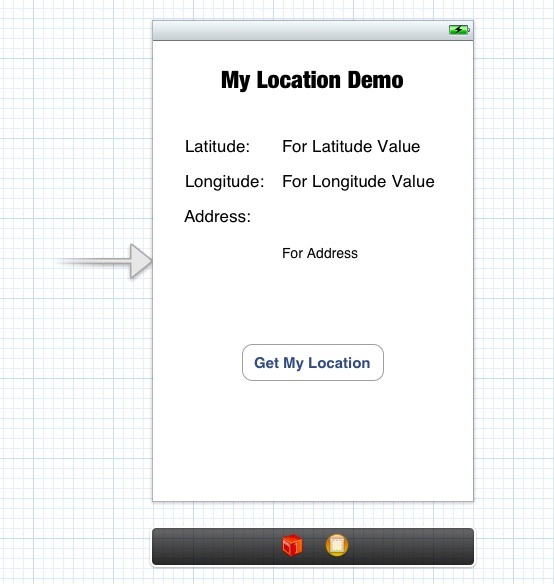 In this tutorial, we give you a simple demo to show how to use the Core Location framework. The app is very basic. If you’re going to develop a real app, don’t forget to handle various error cases such as network error. So what’s next? We’ll continue to work on the demo app and display the current location in a map. As always, leave us comment and share your thought. nothing happens when I touch the button! one or two things need to be added to the info.plist and request the authorisation. go through the link if you are using latest ios sdk. Really great tutorial, thanks a lot. Can I get the current time of the desired location from the gps coordinates ? great article, worth reading it….thanks….. Both the purpose property and the didUpdateToLocation method are deprecated in iOS6. It will build with didUpdateLocation but you will need to comment out the purpose assignment statement. Being new to ios coding…..
which part is the purpose property? Being new to all of this…. which part is the purpose assignment statement? i want this project can you please give me link to download it?? Hi, did you find the link? Thank you, mine is not working either. Missing a key piece of info. Don’t forget to add @synthesize longitudeLabel, latitudeLabel, addressLabel; in the viewController.m file. I didn’t think this was needed anymore since iOS 5 I think. Otherwise, as mentioned by Fancyman, using @synthesize is necessary. where do the synthesize go ? where can i find the source code ? Awesome as always! Really like that you are detailed and don’t leave anything out! Having a problem with this, I only get new coordinates EVERY OTHER TIME I click the button, not every time. What’s up with that? Anyone having the same problem? You always do very good,great and clear tutorials! Thanks for sharing with us! Keep up the good work!! Thanks for your support. More tutorials are coming. Keep coming back! Thank you so much for this tutorial. However, I’m running into a few issues. Can you please post the source code for this one as you’re doing for the newer tutorials? This is awesome, thanks! Will this return the name of business nearby or just the address? Just put “self.” before both of those lines. Here’s how they’ll look. The “self” prefix indicates to the class that the code is referring to an instance variable defined in the class. use _latitudeLabel.text and _longitudeLable will resolve the problem. It is the very good example for learning how to use the current location in my app. Doesn’t work in current version of Xcode. Xcode 5. I can’t retrieve the address but latitude and longitude value is fine. If the tutorial doesn’t work for you and you are getting all sorts of parse errors (like myself), try and set the deployment target to IOS 5.1 instead of 6.1…that helped for me (plus the ‘self.’ addition to the addressLabel described below). i got postal code and locality null. how to get postal code. so a big big thank u for u guys. This was a very valuable tutorial for an Obj C beginner. You did a great job; content, presentation, format; everything! Very useful, thank you! Sometimes when I run the app I get a (null). Is it possible to make it so (null) never appears? how can i show a pin on user current location?! Not working for Xcode 5 at all. Any tips on how it has changed? I dont quite understand the new deprecation technique. Nothing happens when I press the button, everything seems linked…Any tips? click “more” to expand the text just below the file title. I was facing the same problem, and after some digging, realized that it has to do with needing to ask permission to use the location services. u have to add entries in info.plist etc. Great tutorial, very well explained and thank you. It seems in iOS 8 there are few changes in using Core Location like adding key to the info.plist and requesting the authorisation. //Do some stuff after the button is clicked. // Ask for permission to use location services. // Note the under-bars previxing the latitudeLabel objects. 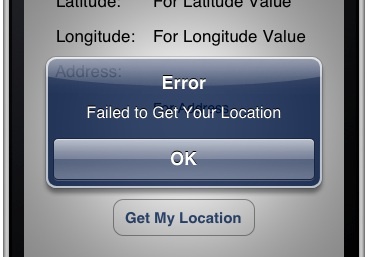 current location latitude and longitude getting zero values sometime on ipad how can solve this issue? please help out. Is it posible to put tutorial “how to find nearby schools or stuff like that”…. connect to gmaps or something like that and use it to find specific places? Is there an updated version of this for XCode 8, iOS 10. Which doe3s location services differently? 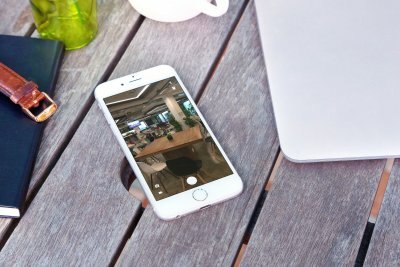 don’t you have swift tutorial for this ‘location app’?